Pilates helps us to achieve and maintain good alignment through our bodies by improving the flexibility and tone we need to stand, sit and move well. ​a healthy back and pain-free body. A flexible body is one that can move well. As we age we naturally start to lose joint mobility and muscle tone which in turn can lead to poor balance. Why is our posture so important for our health and well-being? Poor posture can lead to pain and injuries when our joints are put under stress such as when sitting for hours hunched over a laptop or standing with the hips or head too far forward. The Pilates exercises stretch muscles and mobilise joints, improve muscle strength and core stability and so allow us to achieve good alignment and posture naturally. Pilates teaches us body awareness so we are able to correct poor postures and then gives us the natural strength to maintain better positions and movement patterns. Nowadays there are alot of of Pilates classes and instructors around and it is not always easy to know if a class is any good. At Pilates Therapy all our instructors have undergone rigorous and extensive training with well-known and respected Pilates schools so you can be sure they are both knowledgeable and safe in their methods. All are Pilates specialists with individual areas of expertise and experience. We keep our classes small (between 6 and 12 people in a class) so that we can pay attention to each client and correct and advise individually. Classes are held in and around Worcester and Malvern, in locations such as Rushwick, Hanley Swan, Powick and Kempsey, on Monday to Friday, in the day and in the evenings, so there is plenty of choice and you should find a class to suit you. Many of our instructors also offer one-to-one sessions as well. Many people find the Pilates Therapy exercises enormously beneficial in reducing back or neck or joint pain as we learn to move well and adopt postures and positions that are kinder to our joints. Pilates is recommended by physiotherapists, Osteopaths, Chiropractors and doctors as well as sports coaches and trainers. Pilates conditions the whole body helping you to enjoy daily activities and sports with greater ease, better performance and less chance of injury. This is why so many elite athletes now use Pilates conditioning as a critical part of their training regime. Pilates can help to re-train your body to move in safer, more efficient patterns of motion - invaluable for injury recovery, sports performance, good posture and optimal health. Pilates elongates and strengthens, improves muscle elasticity and joint mobility. A body with balanced strength and flexibilty is less likely to be injured. It's not just for athletes! 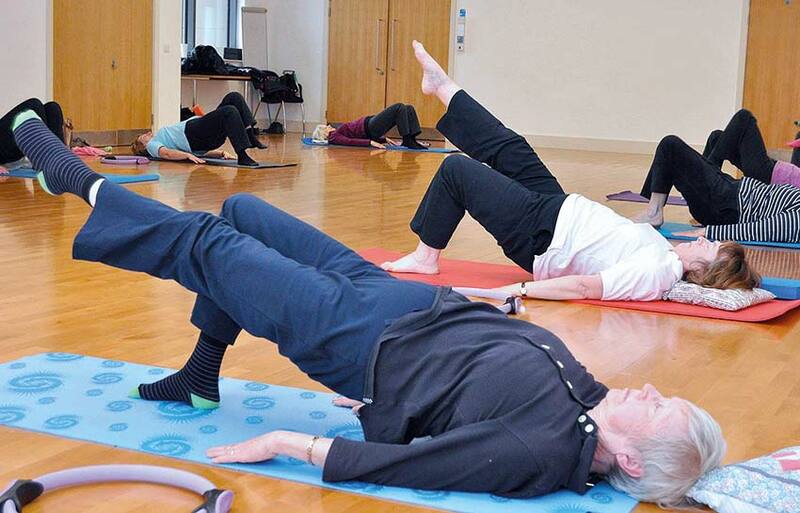 Anyone at any age can practice Pilates as the exercises can be modified to suit all ages and abilities. Our eldest client is 83 years old and is in fantastic shape! Many of our more elderly clients comment how pleased they are that their balance has improved and so therefore has their confidence when walking, climbing stairs or getting up from the floor. All Pilates Therapy instructors are well-trained and experienced in modifying exercises to make them suitable for our wide range of clients and abilities.